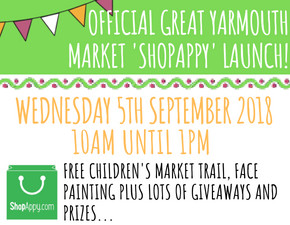 Help us celebrate our local market with the official launch of 'ShopAppy' - the brand new click and collect service for Great Yarmouth Market. 'Funki Faces' will be offering face painting and glitter tattoos to those willing to sit still for long enough! Plus we will be handing out vouchers and other yummy giveaways!